Competing with Microsoft's Xbox 360 and Sony's PlayStation 3, the Wii is also a home video game console released by Nintendo. It's well known that PS3 offer native support for Blu-ray disc apparently, while the popular Wii has no luck on this aspect. The Nintendo Wii can only play Wii and Gamecube games, no support for CDs, and DVDs, not to mention Blu-rays. If you are a Wii enthusiast, then you might be feeling disappointed or left out owing to the fact that you cannot play Blu-ray on your Wii. Yes, it is true that neither the Wii console, nor the new Wii U plays Blu-rays. However, if you stick to the method below you can make Wii plays your Blu-ray movies. It's important to note that some people find it difficult and demanding. Nevertheless, it does not mean that all is lost since they can use a converter to convert Blu-ray to Wii supported file format. In fact, converting the Blu-ray files into a Wii supported files is safer than other methods since you do not risk bricking your console if anything goes wrong. EaseFab Blu-ray Ripper offers specified video formats for Wii and many other game hardware like PSP, PS4, Xbox 360, Xbox One and more. With it, you will be able to watch any Blu-ray movies via Wii. It's well compatible with Windows oprating system and converting with fast speed and extremely high quality. Below are the steps to change Blu-ray format to Wii with EaseFab Blu-ray Ripper, only with a simple clicks, you will finish the conversion from Blu-ray to Wii acceptable format. Below is the detailed procedures on how to convert Blu-ray to Wii supported format. And the screenshots are taken from the Windows version of Blu-ray Ripper. Download and install EaseFab Blu-ray Ripper. Launch it and click the Load Blu-ray button to import the Blu-ray files that you want to convert to play with Nintendo Wii. Both ISO, IFO and files in DVD Folder can be loaded. This Blu-ray to Wii ripper provides optimized presets for Wii. So in this step, you can just choose the ready preset for Wii as the output format, which will remove all the incompatibility issue. 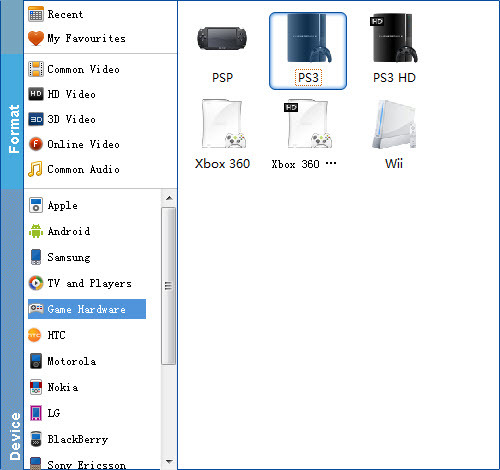 When all settings are done, simply click the Convert button to begin the conversion from Blu-ray to Wii. You will get the files converted ready in a few minutes. Once finished, you can click "Open" button to get the final generated files for your Wii with ease. With multithreading technology and advanced audio and video in sync technology, the application will finish conversion task at super high speed without any audio and video out of sync issues. Now you're ready to play Blu-ray movies on Wii. Just add the files to SD card of your Wii for entertainment.